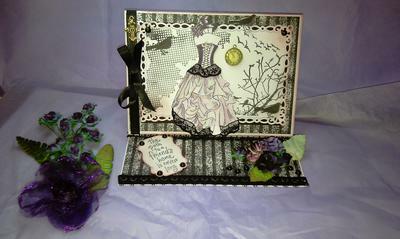 I have a friend who is a 'Goth' and she asked if I'd do a card for her friend who is also a Goth enthusiast. I am 62 and really didn't know quite what it was till she explained the basics. Blood red, black, grey, lace, Victorian type clothes, bodices, romantic and elegant with a dark 'twist'. I have since sent the card I made and she says it is perfect for her friend. The backing paper was a grungey black grey white stripe that seemed to suit the card I had in mind. All on white card stock. Please see Christina's explanation for the type of card. The top I created firstly by using a light rub (sponging) of deep pink ink around the edges. I stamped, coloured with ordinary colouring pencils and then highlighted with Tim Holtz distress markers. I then glued a piece of black lace to the bottom of the bodice, - securing it with double sided tape to the back of the image. I did the same thing at the bottom of the skirt. I cut out two birds that were stamped and put one on the top of the card and one to the bottom right to make it look like it was in the tree/bush. Other elements added - a little brass clock charm off centre and a brass/gold tone cross to the left, black satin shiny ribbon held with double sided tape and a bow added to the top. Lastly 6mm flatbacked beads from ebay. The Stampin up sets that I have come from my lovely and wonderful husband who says he wants to encourage my hobby and this way I buy something I not only get to keep ( he loves that) but create beautiful things for others and ENJOY USING IT. My friend loves this card and knows her other pal will. 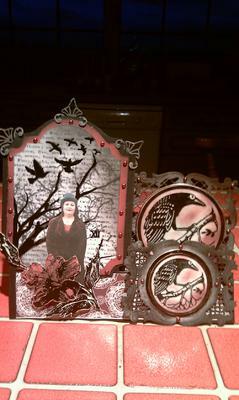 The second card is a Goth card I actually made for my friend whom I put in the midst of her own card! She loved that too! What an excellent job you have done on both of these cards and I can why your fiend would have been pleased with them. The effect is just the right amount and the colours are perfect. It is always fun to try new card ideas ... it is what keeps the brains cells active. There are lots of ideas on the website including the Easel Card that Vee has made. I have also included the Double Easel, Twisted Easel right the way up to the Quad Easel ... which is a little more challenging. Very cool card! You've captured the Goth spirit beautifully, Vee. Can't wait to see what you'll come up with next.